The best musicians provide some sort of inspiration. Some make you think, some make you dance, and a few rare performers, including Michael Franti, make you think and dance at the same time. There's an old saying along the lines of ''move your behind and your mind will follow.'' With his mix of hip-hop, R&B, rock and reggae, Michael Franti knows how to get a crowd moving, never more so than on his 2003 classic, ''Everyone Deserves Music,'' which combined thoughtful calls for peace with rhythms that just wouldn't quit. This time out, Franti's band, Spearhead, is joined by singers Pink and Gentleman and the legendary Jamaican rhythm section of drummer Sly Dunbar and bass player Robbie Shakespeare. Despite the strong guest performances, the new CD isn't as consistent as ''Everyone Deserves Music,'' but the song ''I Know I'm Not Alone'' is as effective a soaring call to collective action as anything done by U2 or Marvin Gaye. Franti's still asking hard questions about war and intolerance, justice and freedom. Without claiming to have all the answers, he's prodding listeners to at least join him in asking the questions. In doing so, he's striding along a path walked by Bob Marley, Gil Scott-Heron and John Lennon. 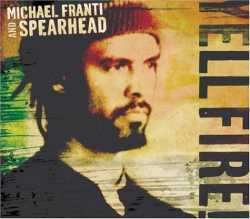 Michael Franti and Spearhead will perform Nov. 10 at Avalon in Boston.